Jasmine Filawo is currently a junior at LFA. 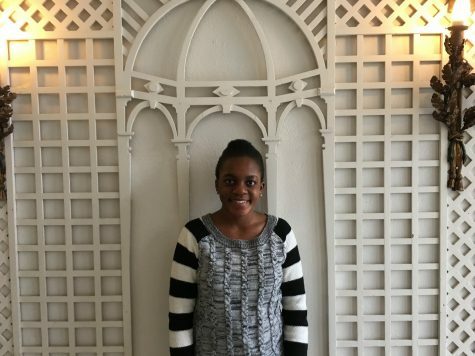 As an upperclassman, her daily schedule is extremely hectic and busy, but it does not prevent her from being involved in the clubs and activities LFA offers. During her freshman and sophomore year, she was part of the girl’s JV basketball team and as of this year she decided to join the musical, which she enjoys a lot since singing and listening to music are what she does during her free time. As for clubs, she is a Facilitator and a leader in the Future Business Leaders of America (FBLA). Not only is she active in clubs, she is also passionate about connecting with her culture and other people’s culture. That is why she enjoys performing African dances with her sister on multicultural day, because she wants people to see the beauty of her African roots. Besides having a passion for learning how unique other people’s cultures are, she wants to continue writing captivating stories for journalism that draw students’ attention. She enjoys writing stories that she is interested in, and she enjoys interviewing students to get their take on their opinions. She is overall excited to be apart of Digital Journalism II this semester because she will be able to learn new skills and techniques about reporting journalism through technology, and display her journalistic versatility to the student body when they read her stories on The Spectator.